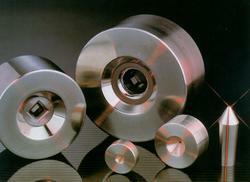 We make carbide dies that are used in bright bar manufacturing on draw benches. We manufacture these as per the requirement of our clients. Our Carbide Bar Drawing Dies are very well polished to give good surface finish and at the same time give good accuracies of sizes. Carbide Bar Drawing Dies well polished to give good surface finish and at the same time give good accuracies of sizes. Looking for Bar Drawing Dies ?